I'll be on tour in Europe from May 20th until June 15th, so I will be unable to ship out orders from overseas. Sorry for any delays, and thanks for your understanding. This tenor banjo instruction manual was prepared in 1989 after years of teaching and playing experience. With the guidance of a banjo teacher, this book will introduce the student to all aspects of banjo playing; from chords, strumming, and reading notes to chord melody playing, jazz solos and arranging. It costs less than the price of a lesson! Tim's FIRST ukulele song arrangement book is completely chord-diagrammed for standard uke tuning, GCEA, so that the student can immediately play each song - instrumentally - in Chord Melody style! This 39 song booklet contains a mixture of popular standards, sing alongs and even Beatles' tunes, arranged with a single note melody line and a tenor banjo chord diagram above each melody note to help the student learn the music as easily as possible. Be sure to check out the Companion DVD too! This 42 song booklet contains a mixture of popular standards, sing alongs and even classical tunes, arranged with a single note melody line and a tenor banjo chord diagram above each melody note to help the student learn the music as easily as possible. Be sure to check out the Companion CD too! This 40 song booklet contains a mixture of popular standards, sing alongs and even classical tunes, arranged with a single note melody line and a tenor banjo chord diagram above each melody note to help the student learn the music as easily as possible. The sixty pages of this book will provide the more advanced tenor banjo student with a challenging variety of jazzy standards. Each arrangement is prepared with a single melody line and chord symbol, plus a helpful chord diagram above most melody notes. However, the student should know how to read "chord melody" as well as the single notes, which will be found in much of this music. 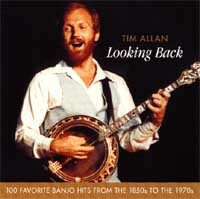 You can play the same music as Tim with this book of arrangements recorded on the CD Looking Back. 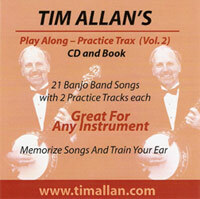 This book contains music for the recordings on Tim's Ontario Banjo - don't miss this one! This book of arrangements covers the music on Love Songs Volume 1. Look for Volume 2 to complete the set! Completing your set of love songs arrangements is a must - now you can play all the recordings in Tim's second book of arrangements from the recording Love Songs Volume 2. All 30 songs from By Request are written out with melody line and chord symbols exactly as played on the CD. Any instrument can play right along for practice and enjoyment, exactly as played on the CD By Request. Memorize songs and train your ear with this fantastic book & CD deal! 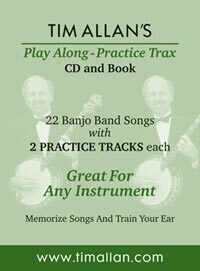 The Book: 22 Banjo Band Songs (23 pages) in easy keys of "c" and "f". Any instrument can read the music, song lyrics included, helpful comments after each song. The CD: each song on the 75 minute CD contains: one slower practice track containing 2 choruses , and one faster accompaniment track containing 2 choruses. 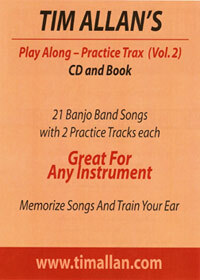 The Book: 21 Banjo Band Songs (21 pages) in easy keys of "c" and "f". Any instrument can read the music, song lyrics included, helpful comments after each song. The CD: each song on the 77 minute CD contains: one slower practice track containing 2 choruses , and one faster accompaniment track containing 2 choruses. 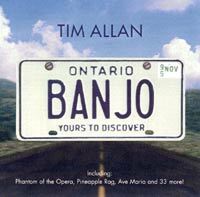 Here is the book of 52 songs that Tim uses to conduct the "Banjos Aweigh" band on each Holland America "JazzSea" Cruise. The book contains each song written out with lyrics and melody line with chord symbols so that any instrument can play along and practice for the next cruise! 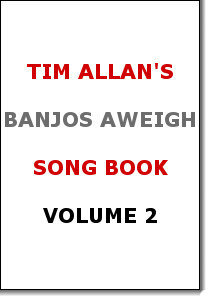 Here is Tim's second Banjos Aweigh Song Book – this time containing 56 songs! 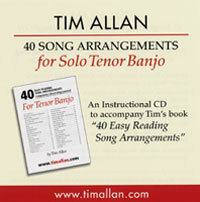 Tim uses both books to conduct the Banjos Aweigh band on each Holland America JazzSea Cruise. This Volume #2 book contains each song written out with lyrics and melody line with chord symbols so that any instrument can play along and practice for the next cruise! Tim's first recording features tenor banjo, mandolin, and guitar on a wide variety of songs which offer some fancy solos, especially on Nola, Granada, Alabamy Bound, William Tell Overture, Bye Bye Blues, and more! With almost 70 minutes of music, this popular recording features the tenor banjo with guitar and bass accompaniment. These 100 popular songs are arranged chronologically into 13 medleys representing each decade from the 1850s to the 1970s. People have said this music is ideal for travelling. My licence was used for the cover. This 50-minute recording begins with an Around The World Medley of 23 songs, followed by modern classics such as Memory and Phantom of the Opera. Also included are 2 Scott Joplin rags as well as many all-time favourites such as Stardust and Ave Maria. This recording contains 36 Christmas favourites played on banjo, mandolin, classical and steel string guitars with bass accompaniment. These instrumentals provide enjoyable seasonal background music. This first volume of love song instrumentals is over 70 minutes long, and contains 41 all-time favourites sure to make you happy. Popular standards by Cole Porter, George Gershwin, Irving Berlin and many more. Also featured is a song written and sung by Mr. Allan entitled "You'd Be Surprised". 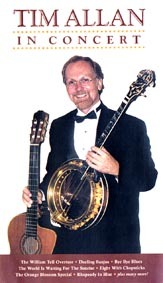 Tenor banjo is featured throughout, with guitar and bass accompaniment. This recording contains guitar and vocals, in contrast with the other banjo discs featured on this page. It contains 23 easy listening songs including What A Wonderful World, Wind Beneath My Wings, My Way, Malaguena, and many more! 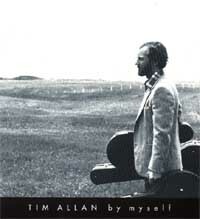 Tim Allan wrote the title song. This second volume of love song instrumentals is 70 minutes long and contains 41 more favourite standards. Featured on this recording is another song written and sung by Tim Allan, titled "You're The One". This recording features guitar and bass accompaniment. Tim Allan plays slow, clear versions of these 39 songs for following the written chord-diagrammed arrangements to help the student hear and see the chords found in each arrangement. Be sure to check out the 39 Easy Reading Song Arrangement Book too! 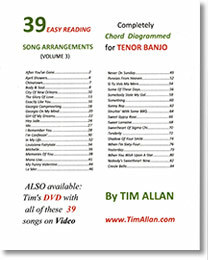 Tim Allan plays slow, clear versions of these 42 songs and provides verbal instructions for following the written chord-diagrammed arrangements..
Be sure to check out the 42 Easy Reading Song Arrangement Book too! 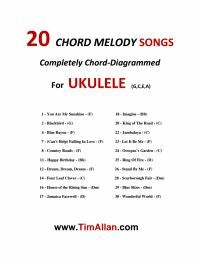 Tim Allan plays slow, clear versions of these 40 songs and provides verbal instructions for following the written chord-diagrammed arrangements..
Be sure to check out the 40 Easy Reading Song Arrangement Book too! Memorize songs and train your ear! 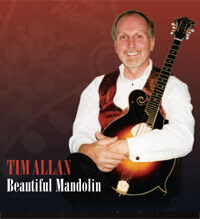 26 beautiful standards are found on 12 tracks of Tim's FIRST Mandola CD. Tim used a WEBER Octave Mandolin, specially tuned to the higher Mandola tuning, to provide a full, rich sound. Because of the Mandola tuning, Tenor Banjo players , as well as mandolin enthusiasts, will find this recording fascinating! 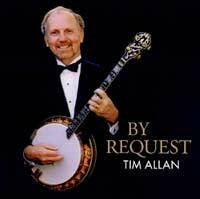 This 91 minute DVD contains Tim's full concert performed n 2000 at the Strong Museum Theatre in Rochester, New York, with banjo and guitar. It features such songs as The William Tell Overture, Dueling Banjos, Rhapsody in Blue, The World Is Waiting For The Sunrise and The Orange Blossom Special.